Our Camel Hair Flat Lacquering brushes are produced with epoxy set camel hair, seamless ferrule and a black lacquered handle. Camel hair is a generic term used to refer to the economically priced soft, natural fibers used in artist brushes. 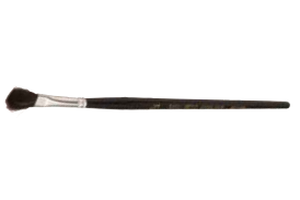 We offer four standard brushes in various sizes, which can be purchased in packs of 12 units. This brush can be used for several applications but is very popular for lacquering, general purpose industrial painting and ceramic applications. Ideally used with low-viscosity paint.